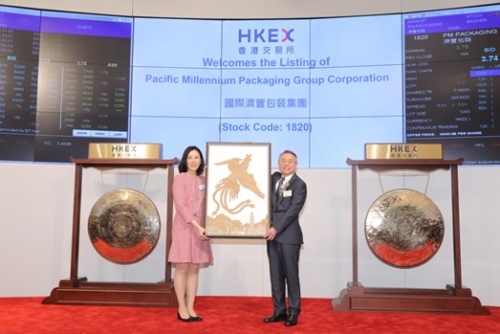 HONG KONG, Dec 21, 2018 - (ACN Newswire) - Pacific Millennium Packaging Group Corporation ("PM Packaging" or the "Group"), a leading corrugated packaging supplier in the PRC, has commenced trading on the Main Board of The Stock Exchange of Hong Kong Limited ("SEHK") today, with 1820 as the stock code. 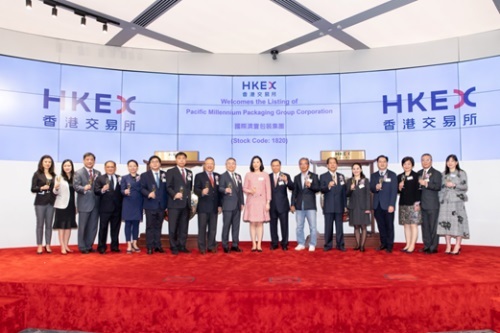 Cheng Hsien Chun, Chairman of the Board & Executive Director of Pacific Millennium Packaging Group Corporation struck the ceremonial gong, marking the Group's important milestone of listing on the Main Board of SEHK. Cheng Hsien Chun, Chairman of the Board & Executive Director of Pacific Millennium Packaging Group Corporation (right) presented a tailor-made corrugated paper-cut painting souvenir to SEHK, demonstrating the Group's creativity in design and execution ability. Established in 1994, Pacific Millennium Packaging Group Corporation is principally engaged in the manufacturing and sale of corrugated packaging products and corrugated sheet boards in the PRC. The Group is the second largest corrugated packaging product manufacturer in both the Yangtze River Delta Region and Bohai Rim Region of China and is ranked seventh amongst the corrugated packaging product manufacturers in the PRC*. PM Packaging operates eleven production plants located in northern, north-eastern, eastern and southern regions of the PRC. With stable and long term customer relationships, the Group has developed a diversified customer base with the majority of its clients being leading players in their respective industries.